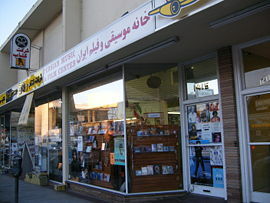 Iranian shops along Westwood Boulevard in South Westwood. Westwood is also known as "Little Persia". Tehrangeles (Persian: تهرانجلس‎), also known as Little Persia, is a portmanteau deriving from the combination of Tehran, the capital of Iran, and Los Angeles. It is used when referring to the large number (estimates range from 300,000 to 1,000,000) of Iranian-Americans and their descendants residing in the Los Angeles metropolitan area after the 1979 Revolution left many families displaced; it is the largest such population outside Iran. The intersection of Westwood Boulevard and Wilkins Avenue is now officially recognized by the City of Los Angeles as Persian Square. Persian businesses in the L.A. area originally centered in the Westwood neighborhood of the Westside. Iranian-owned businesses are particularly prevalent on Westwood Boulevard between Wilshire Boulevard (in Westwood) to Pico Boulevard (in West L.A.). Often referred to as Persian Hills/Persian Square, it is between Beverly Hills and West Los Angeles. Immigration to the area increased several-fold due to the events surrounding the 1979 Revolution in Iran. Westwood Boulevard became known for its many Persian shops and restaurants; and the Iranian expatriate community of Los Angeles entered all forms of media including magazines, newspapers, radio, and television stations. As the population has grown, Iranians and their American-born children count as home neighborhoods throughout Los Angeles, which includes Tarzana, Woodland Hills, Encino, and Beverly Hills, as well as the city of Irvine and elsewhere in Orange County. They have also made their homes in San Diego and the Palm Springs area of the Coachella Valley. In 2012, Bravo began broadcasting the series Shahs of Sunset, set in the Iranian community in LA. In 2018 the novel Tehrangeles, a romantic comedy set in the community, was published. ^ MacFarquhar, Neil (May 9, 2006). "Exiles in 'Tehrangeles' Are Split on Iran". The New York Times. Retrieved June 15, 2009. ^ Montagne, Renée (June 8, 2006). "Living in Tehrangeles: L.A.'s Persian Community". Morning Edition. NPR. Retrieved June 15, 2009. ^ Anderson, Kurt (March 13, 2009). "Mamak Khadem gives a tour of Tehrangeles". Studio 360. NPR. Archived from the original on June 18, 2009. Retrieved June 15, 2009. ^ Dickerman, Sara (June 7, 2009). "Persian Cooking Finds a Home in Los Angeles". The New York Times. Retrieved June 15, 2009. ^ Koretz, Paul (February 26, 2010). "Persian Square approved for Los Angeles, thanks to Paul Koretz motion" (PDF) (Press release). Los Angeles: The Office of Council Member Paul Koretz, Fifth District. Archived from the original (PDF) on November 1, 2012. Retrieved January 11, 2015. Wikimedia Commons has media related to Tehrangeles. Uhler, Andy (August 19, 2015). "Will Iran nuclear deal affect Persian businesses in L.A.?". Marketplace. American Public Media. Retrieved August 20, 2015.